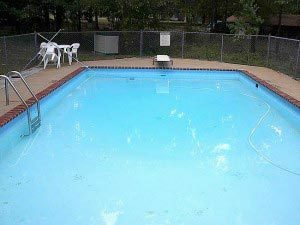 You and your family will have hours of fun in our 20' x 40' pool. Our outdoor pool is conveniently located to all resort accommodations, and features plenty of comfortable lounge chairs, shade umbrellas, and an exceptionally large wading pool for younger children. The outdoor swimming pool is located near our restaurant & general store and just steps away from the kids' playground. We will also be happy to deliver food poolside, just give us a call. Our outdoor pool is open from Memorial Day to Labor Day.